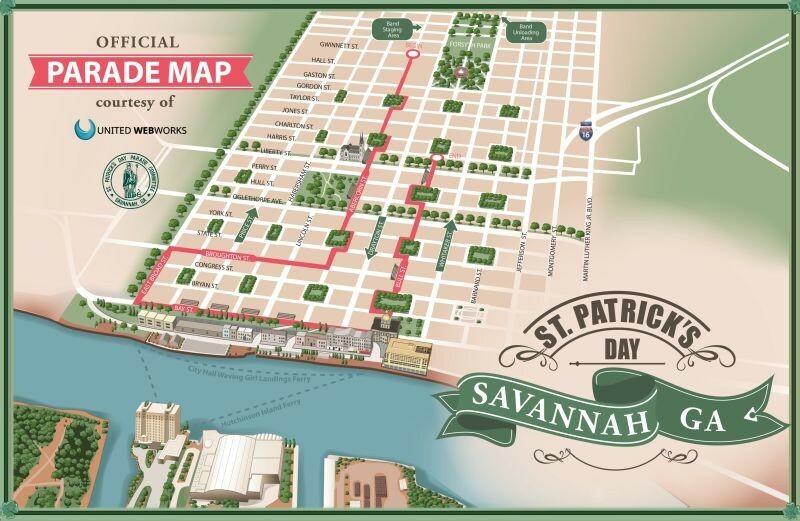 THE Savannah St. Patrick’s Day Parade is generally considered the second largest in the country, after only New York’s. As anyone who has marched in it will attest, it is the longest such parade pretty much anywhere. At over 3 miles and 3 hours long, with about 300 total units, it is a marathon trek not only for participants, but sometimes for watchers as well. While a city-wide celebration, our parade is technically a privately organized event, by the St. Patrick’s Day Parade Committee, which gets a permit just like any other group that wants to march would. 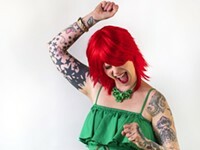 Top O’ The Mornin’. For many members of Savannah’s Irish Catholic community, the day starts early indeed, with Mass at the Cathedral of St. John the Baptist. Every year, tons of people, mostly tourists, just assume they’ll be able to drive right into the heart of downtown right before the parade and get a great spot. As many downtown routes are shut down for the parade, these folks are always disappointed and always look like idiots trying to back up and/or turn around. Crowd Control: The squares along Abercorn tend to be by far the most crowded parade-watching areas. If you’re looking for a bit less crowded scene (but still pretty darn crowded), venture north to Broughton and Bay Streets or closer to the end of the parade route. While as of this writing specifics are scant, Vice President Mike Pence is scheduled to be in attendance at the parade in some form or fashion. Expect even tighter security from a variety of law enforcement agencies. But only if you’re 21 and up! An epidemic of underage drinking has prompted local police to ramp up efforts to crack down, including plainclothes officers. 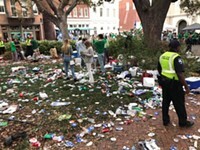 While to enjoy to-go cups Friday and Saturday you are urged to purchase a $10 per day wristband from one of the many kiosks, there will be NO enforcement of wristbands during the parade itself. And if you aren’t going to drink alcohol you don’t need a wristband at all. The Main Event: The parade itself cranks up a little after 10 a.m. and finishes up somewhere in the 2 p.m. range. Yes, the parade actually goes the “wrong way” around the squares. This is the third year of this tweak, designed to make entry/exit of emergency personnel more feasible. If you hear very loud booms, don’t freak out: There are some floats which utilize fake cannonshots. Speaking of this, the funny older dudes dressed in kitschy costumes on equally kitschy floats are the Alee Temple Shriners, who raise money for children’s hospitals. 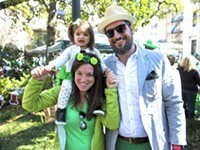 The families ambling along with green jackets and clothes, and occasionally with babies in strollers, are members of various local Irish societies. This may seem odd or anachronistic to outsiders, but these marchers are technically the reason we have this parade honoring Savannah’s long Irish heritage.